On the trip, in the afternoon of March 9th, Minister, Chairman Do Van Chien had a working session with The Department of Locality II (CEMA) located in Buon Me Thuat city, Dak Lak province. At the working session, Nguyen Xuan Duc, head of The Department of Locality II reported the current situation of ethnic tasks in Tay Nguyen. At present, 13 provinces which were watched by the Department have 799 hamlets, 518 communes in special difficulty, border, communes in safe zone which were invested through Program 135. There are 64 hamlets in special difficulty of 46 communes of 23 districts and 10 special difficult communes that reached the goal of Program 135 in 2015. According to scheme 755, at present, provinces in the area have 113.307 poor households that received financial support, the total area accomplished 90% of the assigned plans. For the recuitment policy, since the Resolution No. 134/2006/ND-CP of Government was enacted, 2537 students from 5 provinces, 26 different ethnic minority groups were trained, etc. The Minister, Chairman Do Van Chien highly appreciated the working spirit of leader, cadres, officials of The Department of Locality II as well as pointed out some drawbacks such as: the rate of ethnic minority cadres is low, poverty reduction is not sustainable, complaints taking long time to solve, etc. The Minister, Chairman suggested, The Department of Locality II needs to stick to basis, find out insufficiency as soon as possible, conduct research and suggest a suitable report regulation. In the morning of March 9th, the Minister, Chairman Do Van Chien had working session with the National Broad in Dak Lak province. At the session, Minister, Chairman highly appreciated the efforts of the Broad had shown. The Minister suggested, in the future, the National Broad needs to increase the counseling task with leaders of People’s Committee, People Council and Dak Lak Authority to create Resolution, special Subject or Instructions related to ethnic tasks; the working process of ethnic tasks needs to be flexible, situations need to be responsed fast especially urgent issues in ethnic minority community. 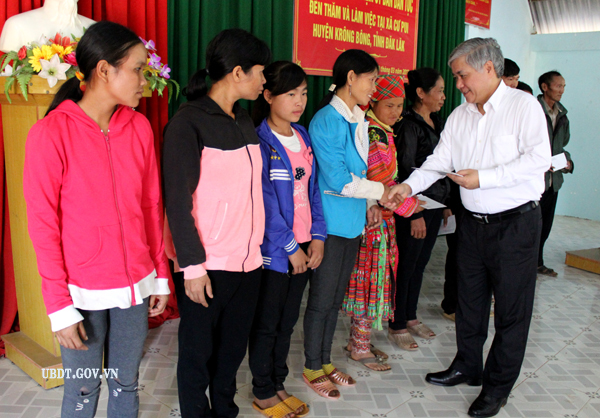 The Minister, Chairman Do Van Chien hoped that the ethnic minority groups in the area will continue to promote the united spirit, preserve their language, unique culture.